One of my favorite holiday movies is “Christmas Vacation”. It is a perennial tradition with my family. It’s one of those movies where I can recite all the lines. In a particularly funny scene, Beverly D’Angelo’s character says to a very stressed Juliette Lewis “I don’t know what to say except, it’s Christmas and we’re all in misery.” Sometimes that line just sums it up perfectly! But what if it could be different? I’m sitting down today with Alex Mackenzie, a behavioral therapist and stress management coach at one of our Crossover Health clinics, to discuss the best tips and tricks for distressing your holiday. D: What would you say is the biggest source of stress for people around the holidays? A: It’s hard to narrow it to just one thing but if I were to boil it down, people often miss out on the joy and replenishment of the holidays because they get too tangled up in their duties, activities and obligations. In particular, obligations to other people. They forget what it is about the holidays that really make them happy. D: Ah, so it comes down to that word…Obligation. D: So, how do you see “obligation” getting people down during the holidays? A: For example, they forget whom they want to spend the holiday with. They get tangled up in spending time with people they have conflict with or who they don’t really enjoy. Because of obligation, they feel they have to entertain or visit with these people. That’s one thing. Another is that people will end up spending much more money out of obligation than is in their best interest. Rather than enjoying the time leading up to a holiday, they will spend their time shopping. Stress increases for the giver trying to figure out what to get people who already have more than they want or need; and material goods don’t do much to increase the happiness of the receiver either. D: What you’re saying is, under the guise of obligation, you’re not increasing your happiness or the happiness of the other person. Obligation makes you spend more of your energy AND your money! A: Research shows that the enjoyment half-life of receiving new material goods is relatively short in comparison with having an experience or sharing a meal or doing something memorable. You might even reflect on things you received that seemed exciting at the time but you no longer use. A: I’m so glad you brought that up. We hear about Maintain Don’t Gain during the holidays, what are some ways people can do that? D: Maintain Don’t Gain is a great golden rule for the holidays. Can you lose weight? Sure, but given all the deviations from our normal routine and the vast amount of tempting foods, maintenance is a great goal. There was some research circulating out there that the pounds we put on over the decades attributed to aging, might actually just be un-lost holiday weight accumulated over the years. You may gain 10lbs over the holiday but only lose 5lbs of it. That can add up over time. A: That is hilarious and fascinating at the same time. D: Tips for holiday? Start with mindfulness. Think about hunger and fullness. Don’t go to a holiday party starving. When you’re hungry, it’s hard to make sound food choices about the quality or quantity of food you’re going eat. Have regular meals and snacks surrounding a holiday meal or party. This also means, not overly compensating for a meal. Some go with the approach of eating nothing leading up to the meal to “save up” but that can backfire. Another great tip gleaned from some research done on buffet eating was to survey all your options before selecting. If you take a look at everything that’s offered, you can then hone in on the foods that seem the most appealing. A: Those are great points! What I’ve learned from you over the years is the unsustainability of denying yourself. If you continually deny yourself foods you want to have, you might make up for it, and then some, later. D: To tie into that, when you’re surveying the options, choose the foods you actually want to eat rather than eating things just because they’re in front of you. Using Thanksgiving as an example, you might really want pumpkin pie. You only get it once a year and it’s something you want to eat and enjoy. Certainly, you should have a small piece and eat it mindfully. Ask yourself, though, what on the table can you forgo? Maybe it’s the dinner roll or maybe stuffing isn’t your thing, so don’t have that. It’s about balance so that you’re not feeling deprived but you’re also leaving the party feeling successful. A: I’m glad you invoked the M-word…Mindfulness. It’s so important not only to do this at your meals; it’s also so important to do the same thing through the holidays. As you go from one party or interaction to another, really focus on the moment and not on what you need to be doing as that can diminish your joy. Be in the moment and don’t worry so much about whether you’re living up to expectations or if you’re prepared for the next “thing”. Savor what’s in front of you. D: I couldn’t agree more. One particularly wonderful memory I have from childhood is decorating the tree with my family. It was the only thing we would focus on for the entire evening. We would get out our ornaments, and ornaments were sort of our thing. We all had our own collection. As we would put them on the tree, we’d talk about where and when we got them, which was our favorite and took care in deciding where to put each one on the tree. It was such a wonderful experience, that if we weren’t in the moment, it would’ve robbed us of something really beautiful and meaningful around the holidays. A: Thanks so much for sharing that; it was a really beautiful of example how mindfulness can contribute to positively to the holidays. D: What about stress and travel? And I mean the actual act of traveling. 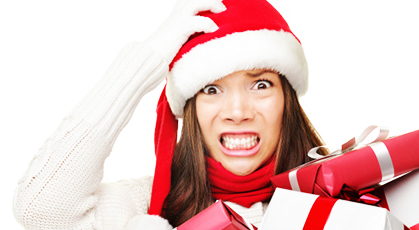 How does that lead to stress or distress during the holiday season? A: Well, of course, the holidays are the busiest travel season of the year. Airline travel, in particular, is troubling because they have their worst on time performance partly because of weather but also due to the number of people traveling. Not only are you paying top dollar for tickets but you’re competing for limited resources like seats and luggage space. And everyone is cranky, your fellow travelers and the service people who wish they were home with their families instead of helping you to your destination. Car travel, similarly, will be worse this year due to lower gas prices. There will be more people on the road than ever and with more people; there may be more impaired people. Maybe people who are too tired or who have used alcohol or other drugs. So I just encourage people to be think about their safety and ask themselves if making this trip at this time is worth it. Will the joy you get out of the trip compensate for the stress of the actual travel. D: Definitely, and as a person who will be traveling this year, I did weigh the pros and cons. Some tips for travel include giving yourself plenty of wiggle room in your schedule. Plenty of time to get to the airport, plenty of time to make that drive, plenty of wiggle room between arriving at your destination and your first obligation. Give yourself that latitude to not feel rushed. That can be an easy way to cut back on the stress of travel. A: That’s a very important point that you raise for life in general. People often feel they need to maximize their time, including time at their destination. But in so doing, they really stretch themselves thin and that gets in the way of their enjoyment. D: We’ve talked about a lot today. If you had to boil it down to just one solid tip for surviving the holiday, what would it be? Ok, maybe I’ll allow more than one. Keep the focus on the relationships that are important to you during the holidays. Don’t get too tangled up worrying about what might go wrong, or if the rituals aren’t exactly how you envisioned. Your holidays might not look like the ideal media version and that’s fine! Keep the focus on your loved ones and the quality of those interactions. The other thing is to keep some time for replenishment during the holidays so you don’t end up feeling depleted. Do whatever replenishes you, it could be a nap, meditation, exercise, or a manicure/pedicure. Just make sure you’re building in time for self care. D: Excellent discussion on tips for surviving the holidays. Thank you so much, Alex, for your time and excellent input! So there you have it, our best tips and tricks for keeping this holiday season low in stress and high in replenishment. We at Crossover Health wish you a very happy and healthy holiday!